The reported missing files from the Belgian folder are all re-newed now. Many thanks for doing that, Elroel! Let me suggest that we rename this thread for a discussion of Belgian downloads-- I don't want to create another thread. This track is from an interesting-looking LP called Les Synthetistes a Prague. Here is the cover. This is the portion of the booklet describing Poot. Marcel Poot (7 May 1901, in Vilvoorde, Belgium – 12 June 1988, in Brussels) was a Belgian composer, professor, and musician. His father, Jan Poot, was Director of the Vlaamse Schouwburg (Flemish Theater) in Brussels. At the Brussels Conservatory, Poot studied organ with Gerard Nauwelaarts, and composition and instrumentation with Arthur De Greef, José Sevenans, Martin Lunssens, Lodewijk Mortelmans, and Paul Gilson. He also attended the Antwerp Conservatory and furthered his education with Paul Dukas at the École Normale de Musique de Paris. After completing his studies, Poot worked firstly as a music teacher, reviewer, and freelance composer. In 1925, he and several other former students of Gilson's formed a group of musicians called Les Synthétistes, who styled themselves as a Belgian equivalent of the The Mighty Five in Russia and Les Six in France. Through the group, they hoped to combine their strength and inject dynamism into an otherwise conservative Belgian musical scene, through the composition of solid contemporary pieces. Other composers who joined Les Synthétistes were René Bernier, Francis de Bourguignon, Théo de Joncker, Maurice Schoemaker, Jules Strens, and Robert Otlet. 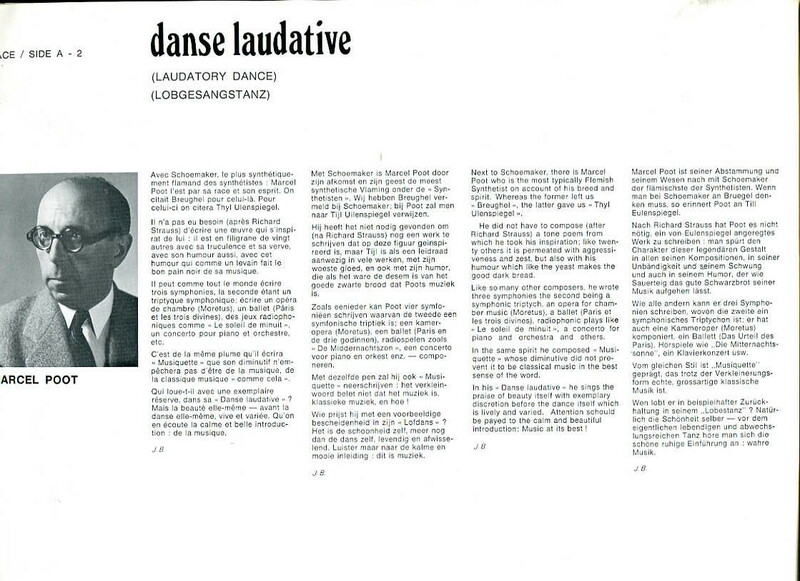 Poot was an active music commentator for fifteen years, finding a principal outlet in the magazine he co-founded with Gilson, La Revue Musicale belge. He also contributed to Le Peuple. In 1934, Poot seemed to achieve fame outside Belgium almost spontaneously after completing his Ouverture joyeuse (Joyful Overture), a work dedicated to his former teacher Paul Dukas. He also composed a substantial wind and brass oeuvre which is often played and performed by students and professionals alike. In 1939, Poot was appointed a Lecturer at the Brussels Conservatory, and later became Professor of counterpoint and harmony, before succeeding Léon Jongen as Director in 1949 and holding the post until 1966. In 1960, Poot founded the Union of Belgian Composers and became its first practitioner. From 1963 to 1980, Poot chaired the jury of the international Queen Elisabeth Music Competition and wrote several commissioned works to mark the occasion, one of them being the "Concerto for Piano & Orchestra." originally composed in 1959. It is rarely performed but recently received an American performance in 2007 by the Valley Symphony Orchestra (LAVC) and pianist Neil Galanter. He also served as the director of the Musikkapelle Königin Elisabeth between 1969 and 1976. He was elected to the Royal Flemish Academy of Belgium for Sciences and the Arts. All download links I have posted are for works, that, to my knowledge, have never been commercially released in digital form. Should you find I've been in error, please notify myself or an Administrator. Please IM me if I've made any errors that require attention, as I may not read replies. 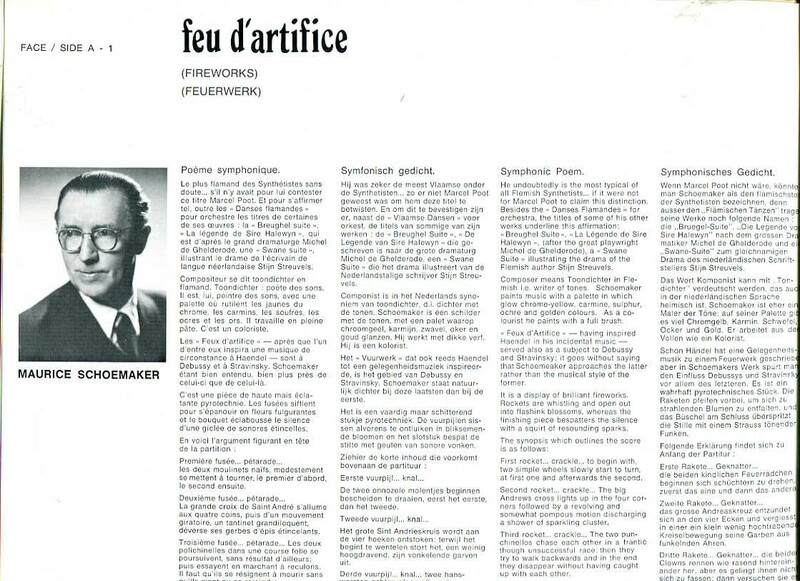 Note: The Symphony is from the same LP source as that posted previously by Elroel, but the Feu d’Artifice was noted as being from a Czech album. For those of you who already have these works downloaded, it may not be worth your while to download this. One the other hand, if you are a completest, you may wish to give it a try. The Feu d'Artifice was taken form the same source as the Poot Danse Laudative, where you can see a reproduction of the album cover. The discussion of Schoemaker from that album is reproduced below. Kersters did his studies from 1945 at the Royal Flemish Conservatory in Antwerp in harmony and piano. After he completed his studies at the Royal Conservatory in Brussels with Jean Louël, Jean Absil and Marcel Quinet, counterpoint, Fugue, Marcel Poot, composition and orchestra conducting with René Defossez,. After he had graduated, he was several years in the cities of Tienen, Leuven and Aarschot worked as a music teacher. From 1961 to 1968 he was in the function of a leader of the music program at the BRT. From 1962 he is also lecturer in harmony and later also composition at the Royal Flemish Music Conservatory in Antwerp. In 1967 he was professor at the Conservatory in Maastricht for the music theoretical subjects called. In this position he remained until 1989. For his compositions got Kersters national and international prizes and awards. From 1962 he also held functions at the Royal Conservatory in Antwerp, first as a teacher of harmony, and later as the head composition teacher. In addition, he became the head of the theory department at the Maastricht Conservatory in 1967. Among his pupils may be cited Alain Craens, Koen Dejonghe, Jan De Maeyer, Luc Van Hove, Wim Henderickx and Marc Verhaegen. In 1989 he stopped teaching at these two conservatories. He died on 29 December 1998 in his native city. As a composer, Kersters received numerous awards both in Belgium and abroad, including the Second Count de Launoit Grand Prize in the International Queen Elisabeth Composition Competition in 1961 for the ballet Triomf van de Geest (Triumph of the Spirit, 1959), the City of Trieste Prize in 1963 for his Second Symphony (1963), and an award for his Second String Quartet (1964) in the International Composition Competition for String Quartets in Liège in 1965. In 1968 and 1972, he won two awards for his complete output, the Eugène Baie Prize from the Province of Antwerp and the SABAM Prize (from the Belgian asscociation for authors' rights). Kersters composed the obligatory piano concerto for the 1978 edition of the Queen Elisabeth Competition. At the end of 1990, he was elected a member of the Royal Academy for Sciences, Letters and Fine Arts of Belgium. As a composer, Kersters never attached himself for long to a particular system. His career can be divided into various phases on the basis of harmonic and structural form. The period before 1960 may be characterised as very intuitive in terms of harmony, while the structure was determined by fixed, classical forms such as the sonata and the rondo. Examples from this period include his Concertino for oboe and strings (1953), Six Songs (1953-55), Sonata for viola and piano (1954), Sinfonietta for chamber orchestra (1955-56), Partita for viola and piano (1956) and the ballet Parwati (1956). Late-Romantic and Expressionist characteristics are here blended in a natural way. Influences from Bartók can be heard in, among other works, his Divertimento per archi (1958), with a clear reference to the composer already evident in the title. At the end of the 1950s, Kersters developed a new compositional technique based on the principle of the tritone relationship. This creates something of a bi-tonal system, where two tonalities at the distance of a tritone become completely united in an autonomous new tonality. This harmonic innovation had already grown intuitively over the preceding decades. The harmonic basis of these works can be traced back to the same chord, in which the seventh and the eleventh overtones form the essential components (for example, on a fundamental of c, the notes b-flat and f-sharp ). The ballet Triomf van de Geest (1959) was the first work to be composed according to this principle. Other works in this technique are Six Two-Part Inventions (1959), Two Preludes for Organ (1961) and Psalmen (1962). Quickly working through the possibilities of this system, Kersters soon went in search of new methods of composition. In the 1960s, after a thorough study of the dodecaphonic system, he switched to a serial style, incorporating his theory of tritone relationships. His First and Second Symphonies (1963 and 1964), the Plechtige Ouverture (Solemn Overture, 1963) and Concertmuziek (1964) were the results of this new approach. The four-movement First Symphony is based on four series (one per movement). The Adagio can be seen as a broadly spun-out slow introduction; the two main themes of the Allegro molto are clearly identifiable and a climax is reached on the name BACH; the Adagio is, in terms of form, inspired by an ornamented chorale; the Finale is based on a simple rondo form. In the second half of the 1960s, Kersters developed the 'tonality of the twelve-tone scale', meaning that the tonal and the atonal principle were interwoven. The first application of this system was the Third Symphony (1967). Anything usable, both from the past and from contemporary musical language, was organically integrated into this new idiom. In a work such as Three Preludes (1971) there is hardly a trace left of traditional thematic development. The percussion is given an ever more important role, functioning as a colour element, in such works as Capriccio (1972), or it is used as an independent instrumental group, as in Anaglyphos (1969), with its surprising and absorbing sound combinations. With the move from instrumental to vocal music, Kersters also began to take distance from the dodcaphonic style, which he considered unsuitable for choral works and solo vocal parts. This led him, around 1975, back to his original point of departure, an intuitive style, which was now further exploited on the level of form, so that the structure took shape during the process of composing itself. This phase saw the composition of the large-scale vocal works, such as the Gezellesymfonie (1979, Fourth Symphony) with alto solo on three evening poems by G. Gezelle, Baas Gansendonk (1981), an opera in three acts after H. Conscience's work of the same name, and Het Zonnelied (The Song of the Sun, 1986), after St Francis. For his vocal works, he turned to Dutch, French, English, Catalan and early Italian texts. The melody closely follows the word accents, leading, for instance, to frequent metrical changes in order to place a particular syllable on the first beat of the bar. He showed a preference for texts by Paul Van Ostaijen, as, for example, in the large-scale chamber oratorio, De Feesten van Angst en Pijn (The Feasts of Fear and Pain, 1996). Kersters' extensive oeuvre numbers more than 120 works; and yet, especially toward the end of the 1970s, his compositional activity slowed considerably, a fact that can be attributed to a more critical approach, which led to a lessening of spontaneity. Wow, Mr. Jowcol - had my work cut out trying to keep up with you today; what a fantastic series of works you've given us there. Thank you for Woestijne, Mr. Gauk. Playing now - interesting 'new' name ! many thanks for your newest two contributions. I didn't even know the name of Karel De Brabander up to now! However, I did some research about the date of composition of his Second Symphony and indeed, I found one single source indicating the piece should be from 1978. I'll paste the date in my post. I could not find the date at the sites I visited. Did you by any chance also found the date of his first symphony there? Alas I don't, but I do have the date for the Third Symphony which is given as 1979. Thank you for the Belgian music. Excellent. I might be the only one, but the van Hoof Symphony No. 3, first movement (moderato) has content but no sound. The other three movements are fine.